KFC wanted to boost store visits from millennials and used a smart marketing stunt to gain awareness. But how could it complement launching a burger into space with a campaign that would generate drive visits to their restaurants among 18 to 34 year olds? KFC used a mix of different Snap Ad creative formats, like cinemagraphs and short videos, to promote its campaign. By following creative best practices, KFC found that the Snap Ads which looked and felt like everyday Snaps drove longer average view durations. KFC also launched custom Chain Filters at its locations across the US. 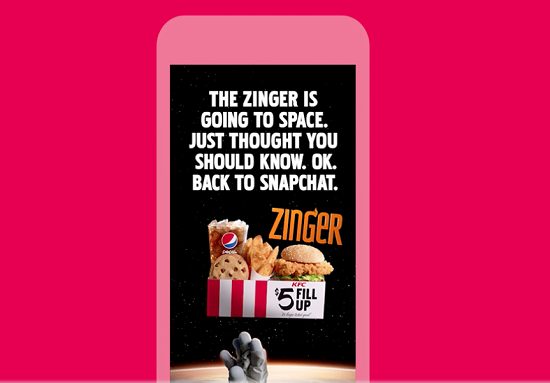 When visiting a participating location, Snapchatters could use a Filter that featured a Zinger launching into space or launching into their mouths. With 180 thousand uses, the Filter received 4.5M views, further driving awareness that the Zinger had made its arrival. By using multiple ad products at the same time, KFC saw significantly higher conversion rates than if they were to have only used one. 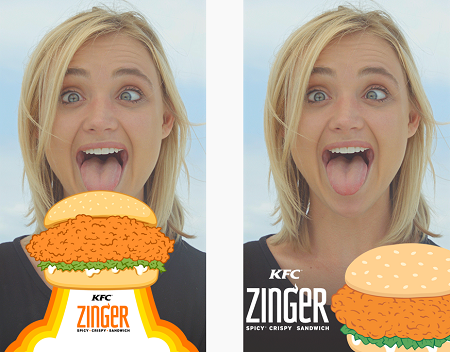 KFC also took advantage of Snapchat’s campaign optimizations to reach its intended audience and test various creative formats, resulting in an 18% lift in visitation and a cost per visit of $0.21.